On 1/28/19 – 2/1/19; C-VINE News, citizen journalists Linda Forsythe and Leonard Bacani were sent too Fort George G. Meade Military Base in Maryland, and observed the military commission pre-trial proceedings through LIVE Stream CCTV scheduled for the United States v. Khalid Shaikh Mohammad et al in GTMO. (Also called the KSM Tribunals). This video Leonard Bacani and I conducted are of critical importance to watch closely, scrutinize and discuss. Please download the transcript for day 2 above and keep for study. Our rights as citizens may be in jeopardy as they are trying to close these proceedings from public view. It is our Constitutional RIGHT to for the public to view Military Tribunals and frankly ESPECIALLY THESE PROCEEDINGS. Don’t let the “pre-trial” label fool you. Things are happening here to set a precedent for future proceedings and take away our Constitutional Rights. Remember all those trials behind closed doors that We the People are STILL waiting to see regarding the un-redacted/declassified transcripts? Well… Military Tribunals via the U.S. Constitution AND Presidential Executive Order clearly stipulates that these proceeding are to be made PUBLIC and only under very narrow specific guideline are they allowed to be held behind closed doors if there are specific detriments to National Security. And even then, after the issue is resolved, the trial is immediately meant to be made available to the public. There are those who question whether our U.S Constitution and its Amendments do indeed give the right to view a Military Tribunal. The United States Court of Military Appeals has recognized the constitutional right of access, mandating the same test for closure in courts-martial as applied by federal courts: “where the state attempts to deny the right of access in order to inhibit the disclosure of sensitive information, it must be shown that the denial is necessitated by a compelling governmental interest, and is narrowly tailored to serve that interest.” In both federal courts and courts-martial it is now clear that these rights belong to the public, not to the government or the defendant, and are fundamentally necessary for the effective functioning of our criminal justice system. Neither the defendant nor the government nor both jointly can shield a proceeding from public view without meeting the stringent constitutional test. Military tribunals are the functional equivalent of federal courts and courts-martial in terms of the press and public’s right of access. The tribunals will act as a “theatre of justice” where those who allegedly sought to terrorize and undermine the United States will be tried. While the defendants may not have constitutional rights because they are noncitizens captured abroad, the press and public do not give up their rights based solely on the forum chosen by the President. A former federal prosecution of terrorists is an example of how a court effectively handled national security information while balancing the press and public’s First Amendment rights of access. In early 2001 Judge Leonard Sand in New York presided over a trial of four members of Al Qaeda, who were jointly charged with Osama bin Laden in a far-reaching conspiracy that spanned at least ten years. The conspiracy culminated in the truck-bombing of the United States embassies in Nairobi, Kenya, and Dar es Salaam, Tanzania, on August 7, 1998, when 224 people, including twelve Americans, were killed and more than 4,500 others injured. The video above was made to cover the main bullet points of these proceedings and are discussed. Please listen and follow along…. If you missed Part ONE of the transcripts from the day before, please download them from below. 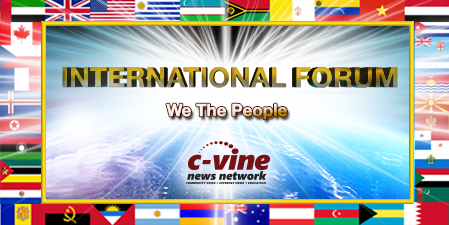 Linda Forsythe – Volunteer Citizen Journalist, News Commentator & Founder of the C-VINE International Foundation. Leonard Bacani is a retired Santa Ana Police Officer and the Founder of HOMELAND SECURITY SERVICES, INC. headquartered in Southern California.